We all know “transistor” is an integral part of any electronic circuit/device. It is very rare to see any circuits built without at least one transistor. This Â semiconductor device is used either for switching purposes or for amplification purposes in electronic devices. They are either packed separately or found coupled to the integrated circuits.Transistors are of two types, PNP and NPN. Most commonly NPN transistors are used. In this article, lets go deep into the interesting history of transistor invention. We have developed this article by seeking inspiration from the good responses we have received for our article on The Story behind Invention of PN Junction. So lets begin our journey on the time machine! To start up with the invention story of transistors let us have a look on the people who were behind its invention. On October 22 1925 an Austrian-Hungarian physicist, Julius Edgar Lilienfeld recorded the first patent for transistors in Canada. But, as he did not make any research publications regarding the invention of the transistor, the industry ignored his work. Yet, he had a major role in the invention of the field effect transistor. Following the works of Julius, in 1934, a German physicist, Oscar Heil marked another patent for the field effect transistor. Though no findings were made at that time, later researches show that Julius Lilienfeldâ€™s transistor gave a perfect result and gain. John Bardeen, William Shockley and Walter Brattain made parallel researches with germanium. Can you guess what made these people work so religiously on transistors? There is a role played by the germanium crystals behind the screen! The ultimate aim of the research was to produce a pure germanium crystal mixer diode that was used in the radars. These radars served the purpose of a frequency mixer. Purdue university proved success in producing pure and a standard high quality germanium semiconducting crystals. As tube based technology was not fast enough, they tried with solid state diodes. Learning more about this diode, they tried making out a triode; however, they found this process to be very tedious. 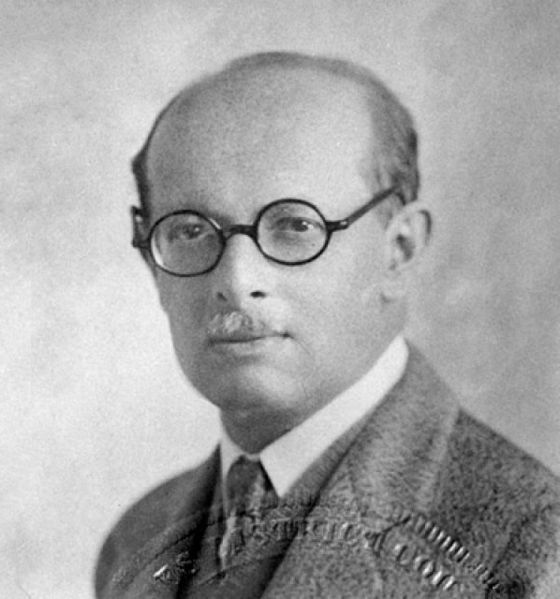 John Bardeen developed surface physics which was an outcome of the research and the odd behavior of the previous study. Bardeen and Brattain succeeded in making a working device and then Shockley attempted to develop a triode based semiconductor device. What is the base for invention? The principle of transistor invention lies on understanding the electron mobility. If the flow of electrons from the emitter to the collector could be controlled by one way or the other, an amplifier could be built of the diode! It seemed very difficult, but Brattain made the move. When the team was working on building such a device, there were many flaws in the research.Â At times the system worked and sometimes it unexpectedly stopped working. And what can be the solution? If there is a problem, there must be a solution. When a non working set up was placed on water, fortunately it started to work! Because of the net charges, the electrons in any one piece of the crystals would move. As opposite charges are more likely to attract, the electrons in the emitters and holes in collectors tend to move towards the surface of the crystal. The opposite charge was obtained from the air or from the water. These net charges can be easily pushed aside by the application of a very little amount of charge from some other portion of the crystal. A maximum injection of electrons that was needed to wash out the charges was then replaced with a minimal supply of the electrons. Thus, the researchersâ€™ understanding paved way for solving the problem. There was no need of two separate or individual semi conductors; instead, a little larger single surface can be used as a replacement. In the new invention, the emitter and the collector were located at the top which were close together and the control lead was placed on the crystalâ€™s base. On applying current, the electrons or holes from the emitters and collectors were flushed out, across the semi conductor and they were collected at the far end of the crystal surface. Though there are many evolutions of the transistor, the first transistor was made after many failures. The BELL telephone laboratories tried on the process and faced no success. The invention of the point-contact transistor is another interesting story. It was found that when the contacts were more closely placed, the system or the set up became even more fragile. A gold coil was pasted at the end of a plastic wedge. It was then cut using a razor at the tip. It resulted in two closely placed gold pieces. It was found that current started to flow when voltage was applied on the other side of a crystal, after the plastic was pushed down on to the surface of that crystal. Thus the point contact transistor was invented. 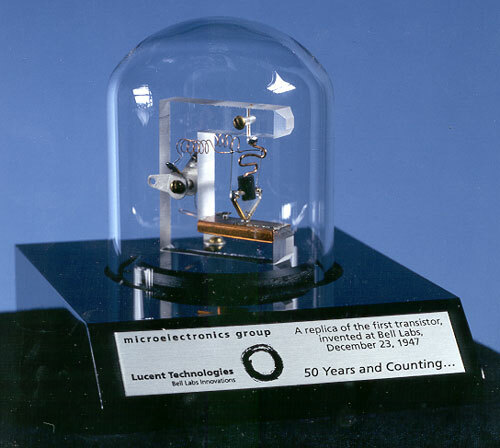 It was on December 16 1947, the double point contact transistor was made, by creating a contact with germanium surface. This germanium was previously anodized to 90 volts and a few gold spots were evaporated. On pressing the gold spots against the bare surface, the gold was set to contact the surface perfectly.Â The points were separated at a distance of about 4 X 10-3 cm. Among the two points, one was used as grid and the other was used as plate. 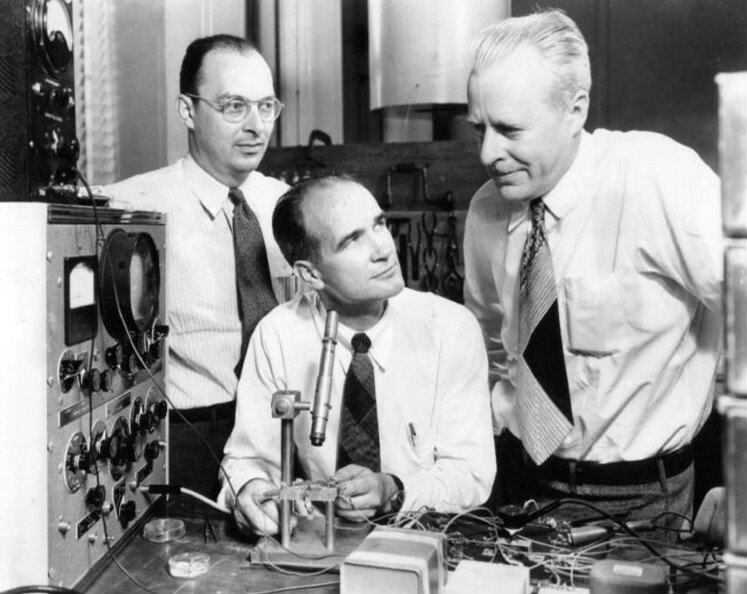 Brattain and Moore demonstrated the set up to several of their colleagues and the invention of transistor was announced on 23rd December 1947. John Bardeen, Walter Houser Brattain and William Bradford Shockley were awarded with the Nobel Prize in 1956 for this life-transforming research on semiconductors and their discovery (rather than invention) of the transistor. Besides John Bardeen, Walter Houser Brattain and William Bradford Shockley, twelve more people are told to be directly involved in the invention of the transistors. In 1948, Herbert Matare and Heinrich Welker applied for patent on solid based transistors which were called as transistrons. Since there wasnâ€™t any announcement from BELL, it was declared that transistrons were developed independently. These transistrons were commercially manufactured and was used in the French telephone Company. thanks for this article.can u publish the article on light dependent resistors? @Archana – We will do one very soon. Thank You For Including Julius Lilienfeld! He had developed Theoretical Version of a Transistor and Took a Patent in Canada in 1925.He Is Credited with the Development of The Electrolytic Capacitor. Could You Imagine If The Transistor was Invented in 1925 instead of 1947?? Our Technology would probably be ahead by at least 20 Years!! MR Heil Should not be ignored,, I like to refer to him as MR FET I Consider MR Lilienfeld and MR Heil as the Grandfathers of Transistor Technology…Thank You,, This is a Amazing Story!! !